The HUE Animation Kit is a complete package of what you need to make a simple stop motion video (excluding a computer). 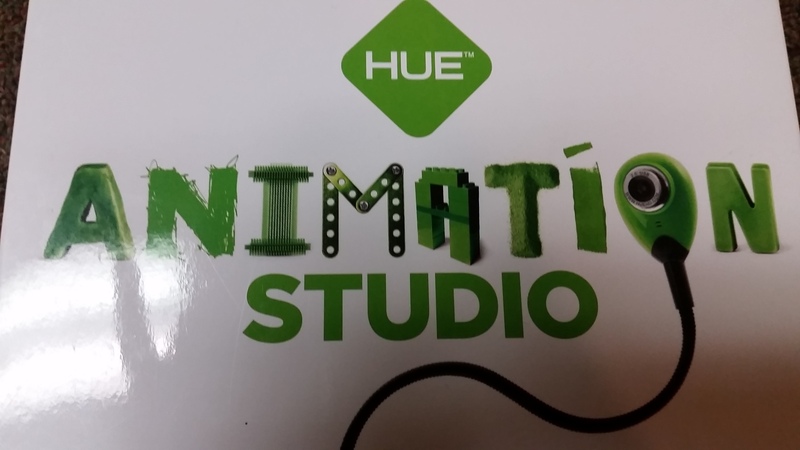 The kit comes with an HD camera, a base for the camera, a cable to connect the camera to your computer, a CD containing the accompanying software, and a book with some basic instructions and ideas for videos. 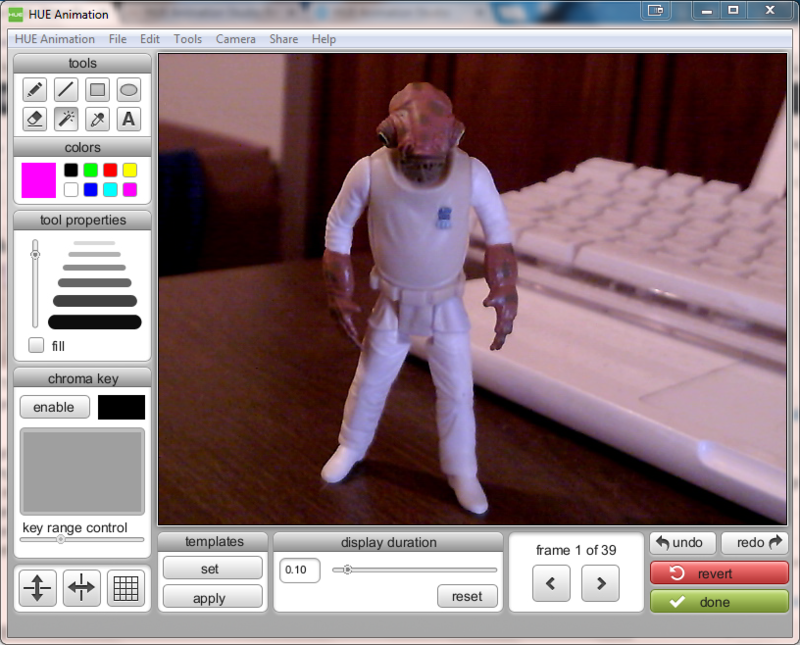 In addition to the software, the CD includes extras, such as backgrounds, sounds effects, and print-out characters you can use for your videos. It would be entirely possible to get started making a video with nothing more than this kit and a computer where you can install the software and connect the camera. There are also sample videos on the disc that demonstrate the ideas and suggestions contained in the included book. Once you unpack the box, the kit is very much plug-and-play. It took me just a few minutes to install the software, plug in the camera, and make a very quick test video to try out some of the features. I did this in between patrons while staffing the reference desk, so that should give you a sense of how quick it was to get going. A few things to think about when you’re setting up for your movie are where you’ll want to place your objects/figures, how you need to twist the camera in order to see them well, and how much light you have. It took me a little practice to figure out how the camera was going to see things and what that meant for how I should place my objects. The camera does have a fairly bendable neck, though, and you can see a preview of its view in the software, so you can use trial and error until you’ve got a good setup. Since lighting isn’t a part of the kit, you’ll want to make sure you’re in a location with good light, or else add some light of your own. I used my cell phone’s flashlight app to help out when I was making the video below. When you’re all ready to start creating, it’s a simple process of clicking a button in the software to snap a picture, moving your object slightly, snapping another picture, moving your object slightly, and so on until you’re finished. The software layout shows your current view, the previous snapshot, and the timeline of your movie. I found it intuitive to do things like delete a frame or even reorganize frames by dragging and dropping. To help in creating your movies, the software also includes a feature called onionskinning. This means you can see a faint outline of your previous frame on top of the camera’s current view, which allows you to carefully set up your next shot and maintain the flow of movement. The previous frame is on the left. On the right is the current camera view faintly overlaid with the previous frame. The editing options the software provides are a mixed bag. In my video, I was easily able to group a bunch of frames, duplicate the whole thing, then reverse them, so my figure could walk backwards to its starting position without me needing to retake all those photos individually.This is the kind of thing the software does well. There are also editing options that let you overlay text, drawn lines, and shapes; this type of editing is much more limited. As far as I could tell, you can’t select a font or edit/move text and shapes once they’re placed, and you’re fairly limited in terms of colors and shapes you can select. It’s helpful if you want to overlay something quick and simple, but I wouldn’t try to add any complex special effects this way. Editing screen where you can overlay text, shapes, drawn lines, etc. When you’re finished, you can export your movie as an .mov or .mp4; there’s also an option to share to YouTube, which will ask for your YouTube credentials, then upload it. Audio: record your own audio track to accompany your video or import existing audio. You can’t do anything too complex with regards to editing the audio, so if you need to be really precise about how things match up, you’ll need to do this in a different program. Time lapse: set up the camera to record on its own for anything from 0.1 seconds to 37 hours (or infinity, which I assume is just until you stop it manually). You can also set up a start time if you don’t want the recording to begin right away. I think this is a really cool feature, and am already thinking about trying this out with the 3D printer to get a time lapse of a print. 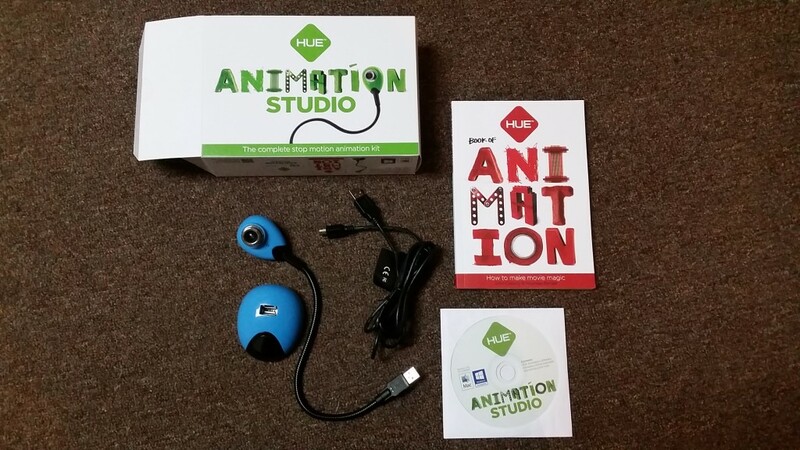 The HUE Animation Kit is a solid stop motion kit. It strikes a balance: while I wished some of the editing features let me do more complex things, I also appreciated the simplicity and how quick it was to learn and start making movies. Onionskinning is really helpful and I’m glad this feature was included. Overall, the software interface was intuitive and easy to use. Buttons and interface elements have pop-up text explaining what they do, and it’s not overwhelming to look at. I felt the kit would be a good option for anyone new to stop motion animation or who was interested in creating videos for fun. As I said, fancy special effects or complex post-production editing would need to be done in a different program, so I wouldn’t use this if you are really advanced at stop motion. Kids and adults who just want to mess around and make videos, however, would be well served here. You could even use the kit to make small promotional videos for your makerspace or library (something I’ve been considering doing). 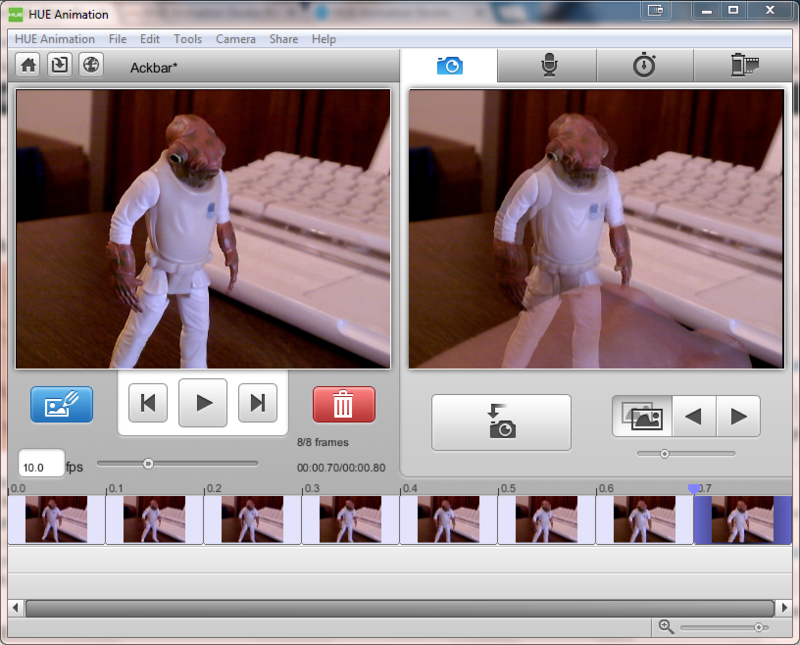 Stop motion takes a lot of patience. That isn’t specific to this kit, but is worth considering if you’re thinking about introducing this to your makerspace. The video above is about three seconds long and took 39 pictures to make. Making something that’s a significant length takes a lot of time and a lot of careful moving of objects. For this reason, stop motion may not be a good choice for everyone at every age. 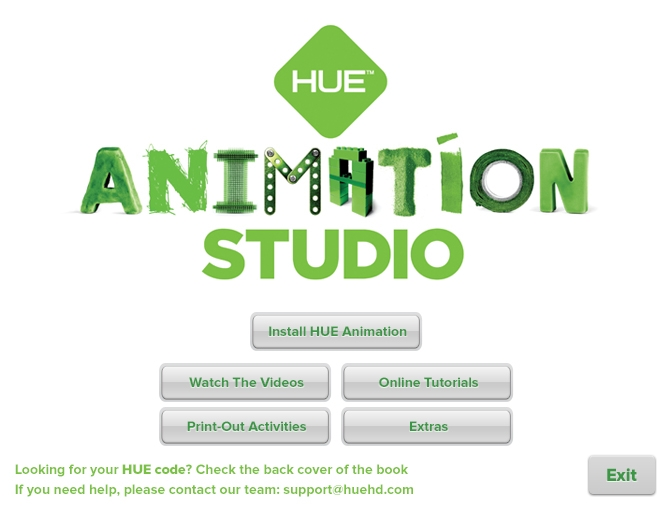 Have you used the HUE Animation Kit or another stop motion kit? What kind of stop motion projects have you created? Share your comments below or tweet at us we’d love to hear from you!